I went to the post office today and guess what I got? That's right, part of my birthday present that my brother was told he was buying me- 2008 Topps Stadium Club Beam Team Robinson Cano Autograph. Not bad for $12 on eBay, and $2 shipping. I was more than pleased with that since if I bought it locally someone would want at least $25-$30 since he's a Yankee. 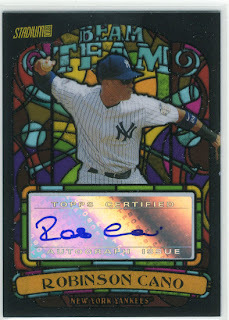 I like adding cool cards like this to my Cano collection. It's alot cheaper than trying to add something like this to my Pujols collection. One day soon, I am gonna bite the bullet and buy a Pujols auto. It took me 2 years to pull the trigger on a RC of him, so the auto is coming soon.